Before any project is undertaken that involves underground trench work, it is imperative to create a construction plan drawing. This plan drawing will simplify your work, and prevent potential problems that not only can be costly but can create an unsafe work environment for both yourself and those nearby. The construction plan drawings will also become the cornerstone to future maintenance and retrofit design work. So always remember to put together a proper construction plan drawing, or hire professionals, especially when dealing with high voltage electric cables. We are going to go over how to properly read construction plan drawings for electrical design work, in order to see the great benefit they bring. 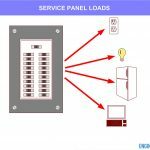 These electrical plan drawings can include telephones, communication devices, electric outlets, lights, conduits, and much more. However, we are going to concentrates solely on conduits, which typically have their own dedicated plan drawing. Below is a plan drawing for a building design that includes 120V, 480V, and 12,000V conduits and cabling. Dashed lines – represents an underground conduit. These conduits are placed below grade (under ground) and are not visible after construction is complete. Solid lines – represents above ground conduits. These conduits are exposed, and are visible after construction is complete. Circles – represents the conduit turning up or down 90 degrees on a plan drawing. In other words, with our plan drawing shown above, the circle represents the conduit going in or out of your screen. So this circle represents several different design outcomes in construction scenarios, which we will go over below. Scenario #1: the conduit is turning up from underground and going above ground. We know this because on one side of the circle is a dashed line and on the other side is a solid line. The circle here represents the transition from below to above grade. What is happening in this scenario in detail? Underground conduit is running from outside of the building into the building. Then where the circle is shown, the conduit turns up from underground and becomes exposed above ground inside of the building. The conduit then runs up along side of the wall, and once it reaches the ceiling it turns and runs towards the electrical panel. The conduit then turns down above the electrical panel, going from the ceiling down into the electrical panel. Scenario #2: the conduit is running above both panels (imagine 10 feet above both panels), and then the conduit runs down to feed each respective panel to connect them together. What is happening in this scenario in detail? The conduit from electrical panel #1 runs straight up and then goes to the right, and turns down once above electrical panel #2, going into electrical panel #2. The two electrical panels are now tied together electrically. This plan drawing does not show how high above the electrical panels the conduit runs. The conduit may run up only 1 foot or 10 feet, or maybe even the conduit is running beneath the two electrical panels (not going underground though). Without a section view of this plan drawing, we cannot determine how the conduit exactly runs. Similarly for Scenario #1, we do not know how deep underground the conduit is when underground, and how high above ground the conduit is when exposed above ground. Scenario #3: here a circle is not shown, as the conduit simply penetrates the side of one panel and goes into the side of the other panel. The conduit does not change directions going up or down; therefore, no circle is shown. What is happening in this scenario in detail? Similar to Scenario #2, the exposed above ground conduit is connecting the two panels together. In this scenario however, the conduit does not run above or under the electrical panels. This exposed conduit connects the two electrical panels from the side. The conduit simply goes from the side of one panel into the side of the other panel. Identify the direction of the north arrow. This is important, especially when the drawing does not have any identifiable key landmarks. A simple miscalculation of 15 degrees in drawing orientation will change the entire design, and the result can be disastrous. Identify everything that is shown on the drawing. If there are building walls, find where they are located in order to avoid running underground conduits there because of the existing building foundation. Even more important is locating all existing gas and electric pipes and conduits that are underground. In large cities especially, the existing power, communication, water, and sewer infrastructure is everywhere. It’s very easy to just start digging without thinking twice over what’s underground. The last thing you want to do is to cut into a live electric cable. Also remember, existing underground infrastructure is not always shown on a design drawing. Thus, it’s recommended that plan drawings from the local utility be requested for review. We avoid the tree by routing the conduit around it. When we look at existing plan drawings, it’s very important to identify objects that need to be avoided. 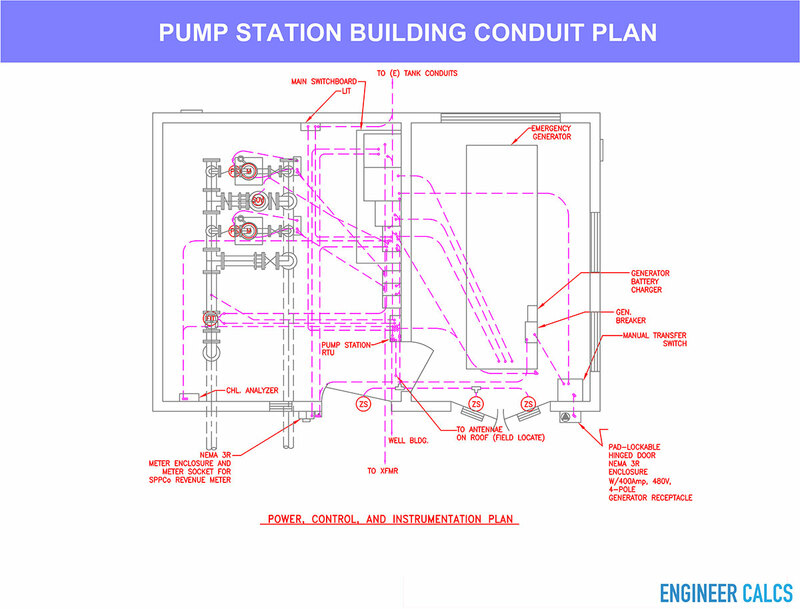 Learn how to visualize what is shown on a plan drawing to best route your conduits. Cross check the plan drawing for any other referenced drawings. There may be schedules, notes, abbreviations and legends, and schematics shown on another sheet that would be helpful to see. Some equipment have clearance requirements on the front, side and/or back. Therefore, with any design, you need to be aware of equipment clearance requirements, in order not to violate the National Electric Code; as well as not creating a safety concern. For example, you cannot have an above ground conduit in these clearance zones. Certain pieces of equipment have clearances, whether on the front, side(s), back, or all sides. These clearances exist for safety reasons and for personnel who work on the equipment. Now in our example, we cannot have a conduit come above ground, an exposed pipe laid out, or anything else that intrudes in the given dashed yellow area. Construction plan drawings for completed projects are schematic design representations only. Meaning, the construction drawings may not accurately reflect what was constructed in the field when design ended. There may have been a change order, which altered the original design drawing. It’s important to know if your construction drawings are the latest, most up to date, version. Also, a contractor does not always construct a project as it is laid out in design. An engineer may lay out a conduit run a certain way in design, but in the field – come construction – the layout may not be practical. As a result, the contractor may decide to run the conduit from A to B using a different route. The takeaway is to always get a hold of “as-built” drawings. As-built drawings show the design after construction has been completed. The original design drawings will have been amended to include all of the subsequent design changes, as well as all of the true field routing done by the contractor. After reviewing existing plan drawings, see if your vision for design is practical or not. The existing plan drawings will help you visualize what is constructed, or will be constructed, in the real world. This visualization will help avoid costly mistakes that sound good in thought, but will not convert in the real world. Here we are simply trying to run a conduit from point A to B. Instead of running the conduit all around as shown in the color green, we simply run the conduit from left to right as shown in the color magenta. This shorter conduit run saves money in both labor and material, and the conduit run is less invasive. With all design elements on paper, it becomes much simpler to grasp the entire scope of a project. All design scope elements will be in one spot, rather than scattered on different sheets, or in your thoughts. Spot safety concerns to be watchful over once construction begins. With all design elements in one spot, you can better see what can be simplified for easier construction, and what simply is not practical in the real world come construction. Avoid future problems. 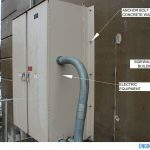 Future maintenance and additions become much simpler when the blueprint of a project is on record. In several months, the design will become a big blur without plan drawings and notes on hand. Construction plan drawings that layout the conduit design are an important piece to every project that involves conduit. Learning how to read and interpret these plan drawings will not only simplify, but will enhance the final construction. It’s another great tool to have in your design and construction arsenal.